Glyn High-Tech Distribution was recently appointed by Swissbit AG as its exclusive distributor for Australia and New Zealand. Swissbit is the largest independent DRAM module and Flash storage devices manufacturer in Europe. As a global technology leader, the company supplies high quality memory solutions to the industrial, embedded, telecommunications, military, automotive and aerospace segments. Embedded and industrial systems require a variety of memory and storage solutions. In contrast to the PC and consumer market, Swissbit industrial products are exposed to critical environmental conditions and designed for longer life cycles while offering high performance reliability. Swissbit’s Industrial Solid State Drive (SSD) family covers all relevant interfaces including Compact Flash Card (CFC), Secure Digital Card (SD), IDE/ Parallel SSD (PATA), Serial SSD (SATA) and USB Flash Drives (UFD) in combination with state-of-the-art flash handling utilising the qualities of SLC NAND flash. Swissbit also offers an extensive portfolio of un-buffered and registered DIMMs and SO-DIMMs as well as a large number of different low profile, mini- and micro-DIMM designs. Their industrial/OEM product line is designed according to the latest JEDEC standards and covers all technologies from asynchronous RAM (EDO/FPM) to DDR3. 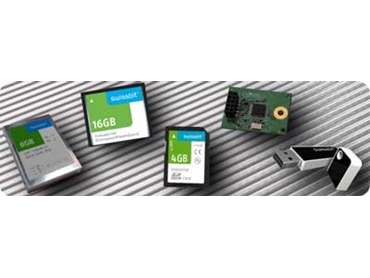 With Chip-On-Board (COB) and Surface-Mount-Technology (SMT), Swissbit offers memory products optimised for multiple system platforms, applications and environment.